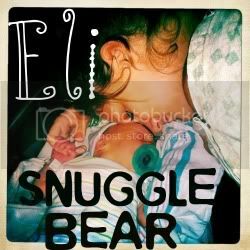 Snuggle Bear Eli: I hope I get this jooooobbb! I hope I get this jooooobbb! Today I applyed for a job at Amy's Icecream. They gave me a bag, and told me to be creative. I don't know about ya'll but, I think I did a damn good job. Okay.. okay... I traced... OH WELL. I loaded Eli in the stroller, and went to turn in my application. I accidently got there before the store was open, so Eli and I played in the grass. I held him as he stood there looking around. I slowly let go. He stood there by himself for 4 long seconds. I could no believe it! HE'S NOT EVEN 7 MONTHS YET! ahhh slow down Eli, please. I'm not sure why, but I feel sooo confident about this job! I think I really might get it! She called me and scheduled an interview for Monday. The position is part time. 2 or 3 days a week. andddd it's late shift! Till midnight or 1am. That's perfecccccct! Just what I was looking for! PRAY FOR ME. WISH ME LUCKKKK! Eli is yet again sleeping in his crib. I'm happy. Although I have definitely been slacking. I've been taking naps with him and when he starts whining during the night I scoop him up and put him back in my bed. Ugh. I seriously need to be more consistent with this. After all... I might get this job and he's going to have to learn to sleep without me. I did think about that! It sounds all dandy and everything, but i do believe I might go insane. I need some time to myself outside of the house. Some adult interaction would really do my sanity some good. and also, i'd only be working after i put Eli to sleep! so it works out great! thanks soooo much allie for caring.